Geese are inefficient eaters. They can eat up to three pounds of turf every day, and will "re-deposit" half of that back every day. Despite previous repel efforts, geese are habitual and will attempt to build a nest in virtually the same spot every year. Sexually mature geese will attempt to build their first nest near where they learned how to fly. Geese are completely flightless during the "molt" season and may pose a hazard to traffic as they walk across roadways. Federal permits are required to remove geese nests/eggs. Turfscape uses a product called Flight Control PLUS to handle geese problems on your property. The active ingredient in Flight Control PLUS is a man-made form of a naturally-occurring compound found in many plants. 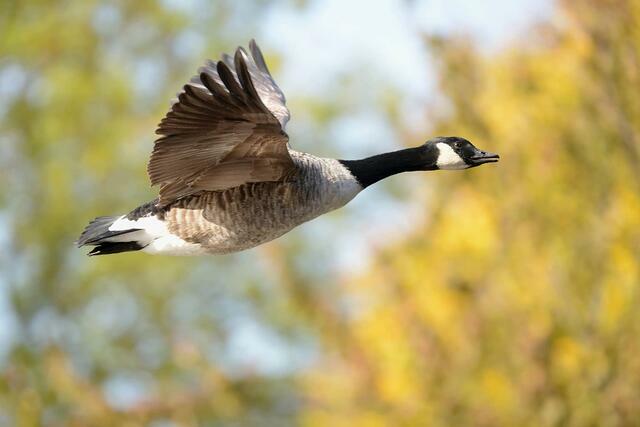 When professionally applied to turf, Flight Control PLUS conditions geese to avoid feeding in treated areas. This product is odorless, waterproof (rainfast) and will usually last through several mowings. Turf treated with Flight Control PLUS looks different to geese in the ultraviolet light spectrum. Geese who feed on treated turf experience a temporary case of indigestion and, after a few days, become conditioned to avoid feeding in areas where they recognize the ultraviolet absorption of Flight Control PLUS. Property owners no longer have to put up with the mess, danger and annoyance that comes along with unwanted Canadian geese. Let us help you remove geese in a humane, effective way. Contact Turfscape today for more information. Information and images courtesy of Flight Control PLUS. George Hohman is President at Turfscape, Inc. He is passionate about the culture and making a difference in people’s lives at Turfscape. He also loves the outdoors. Copyright 2019 Turfscape, Inc. All Rights Reserved. Website by SyncShow.